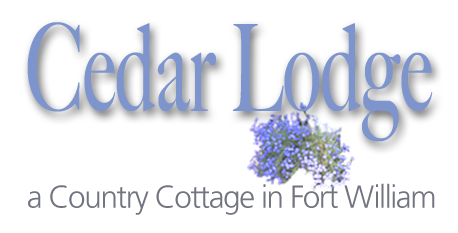 Why stay at Cedar Lodge ? 10 We are here to offer advice and daily suggestions if you are stuck for day trips or activities. We can even offer you a sailing excursion on our own yacht based on Loch Linnhe. We know visitors have a lot of choice when it comes to staying in self catering accommodation. We are pleased to welcome visitors from all over the world and enjoy helping you to get the best from your visit to the Highlands. So, when you book a stay in our Fort William holiday cottage you also get the experience of our extensive knowledge of the local area, where we also live and play. The accommodation is modern and spotlessly clean and we take a lot of effort to present it to you at its best. Our location is just outside of the town centre so we get the benefit of living in a countryside sitting whilst at the same being only 10 minutes or less from shops, pubs and restaurants. There’s an excellent cycle path and route which will take you safely into Fort William without riding on the highway.